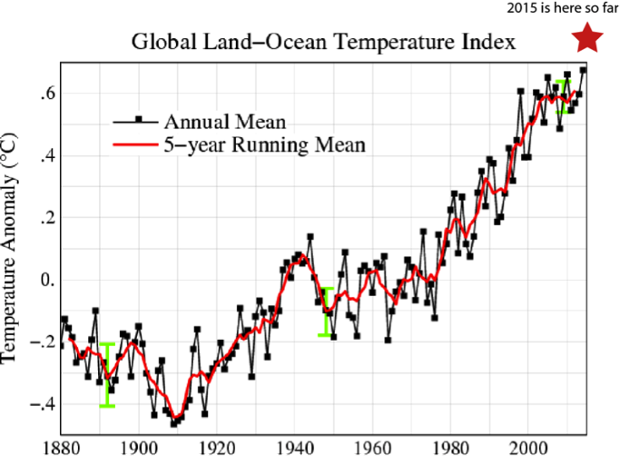 News out from NASA today — the first five months of 2015 are the hottest ever recorded in the global climate record. Global temperatures hotter than any comparable period by a very significant margin. According to NASA’s GISS division, May of 2015 came in at 0.71 C hotter than the 20th Century average. That ties 2012 for the second hottest May since record keeping began in 1880. But, more importantly, when averaged — January (+0.75 C), February (+0.82 C), March (+0.84 C), April (+0.71 C) and now May — the first five months of 2015 come in at 0.766 C above 20th Century baselines. That’s about 0.96 C above 1880s values — a level fast approaching the 1 C threshold and the far more dangerous climate impacts that come after. If 2015 were to remain at such hot levels, the final measure would appear as the star on the above chart. And with the first half of June already seeing +0.7 to +0.85 C warmer than 20th Century conditions amidst a growing El Nino in the Equatorial Pacific, it appears highly possible, even likely, that current atmospheric warming levels could be maintained or even exceeded through end of year. For reference, +0.76 C is fully 0.15 C hotter than the Super El Nino year of 1998 — the cherry of all cherries for global warming deniers. A fossil fueled group that has used this particular atmospheric and ocean cherry as a basis for arguing that greenhouse gas forced global warming ‘paused’ after the 1998 El Nino. A claim that has also been used as a platform to advance a raft of other nonsense including the false notion that climate sensitivity is far less than consensus ranges of 3 C ECS and 6 C ESS (basically meaning that each doubling of atmospheric CO2 brings 3 C warming short term and 6 C warming over many centuries). A claim that was recently also destroyed in a fantastic paper released earlier this month by NOAA. A new study published online today in the journal Science finds that the rate of global warming during the last 15 years has been as fast as or faster than that seen during the latter half of the 20th Century. 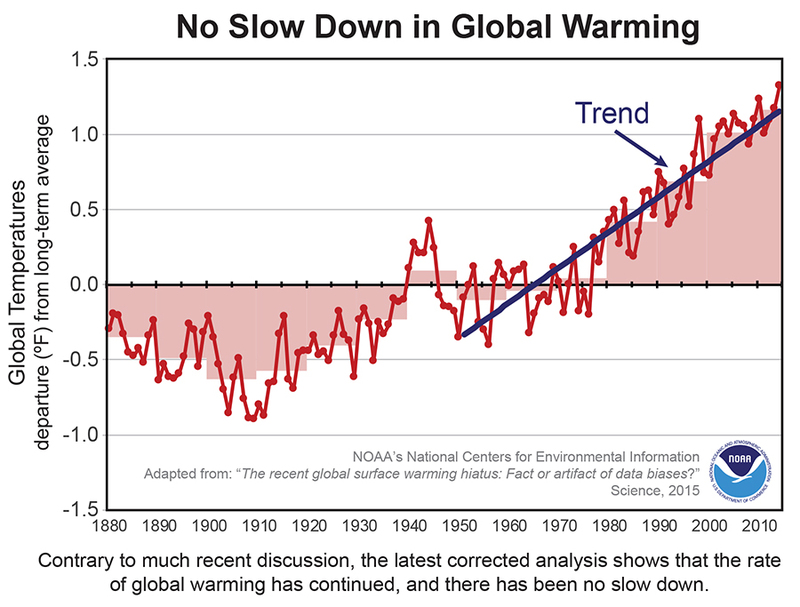 The study refutes the notion that there has been a slowdown or “hiatus” in the rate of global warming in recent years. Of course, any rational observer paying attention to heat accumulation in the top 2000 meters of the world ocean or the ever more rapidly destabilizing glaciers in Greenland and Antarctica already knew that talk of hiatus was probably most likely at best a sick joke. The ocean ends up taking in a far greater portion of the greenhouse gas heat forcing than the atmosphere ever could. As a result, more than 93.4 percent of the heat accumulated by human fossil fuel emissions ends up in the ocean. That’s an enormous amount of heat destined to come back and impact both glaciers and atmosphere even if rates of warming in either of those smaller systems had paused (which NOAA indicates they haven’t). 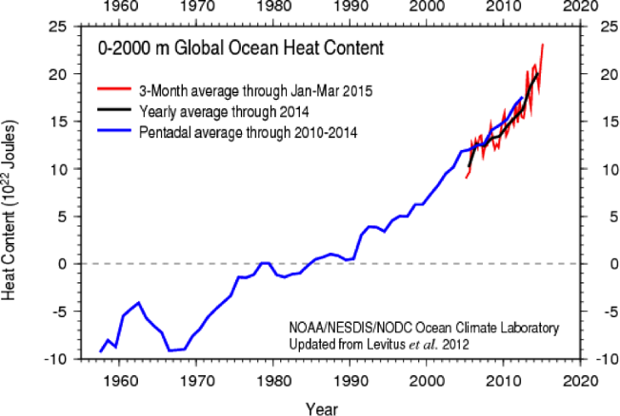 Instead, we see a clearly accelerating rate of ocean warming. A slope that makes one of those sick upward curves we’ve become so used to when dealing with a human-spurred greenhouse gas accumulation at least 6 times faster than at any time in all of Earth’s deep history. It thus now appears that the atmosphere is in the process of catching up to the ocean. And the strong heat bleed off a ramping El Nino in the Pacific now combines with human greenhouse gasses in the range of 400 ppm CO2 and 480 ppm CO2e to enable this ominous heat increase.